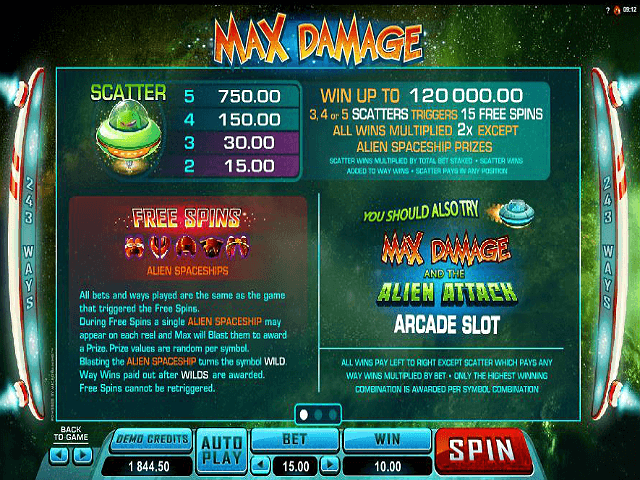 Microgaming's Max Damage and Alien Attack Arcade slot got mixed reviews, with many feeling it was a glorified video game rather than a slot game. What we did love about it though was the cheesy retro theme – so it was nice to see the brand launch an authentic game in the shape of Max Damage back in November 2014. In this one, our hero Mr Max Damage is back – along with those pesky aliens. This time they’re doing battle over five reels with 243 ways to win and a fixed jackpot payout of 120,000 times your bet. With cool retro graphics and sound effects, it has an 80s Space Invaders vibe – with plenty of action courtesy of scatters, free games and multipliers. 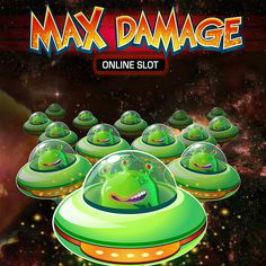 Play Max Damage Slot Demo for Free! Play Max Damage for Real Money! Max Damage delivers a classic arcade slot feel, with the good guys versus the evil aliens. And those darn little green men are clearly coming straight for Earth, as the bright reels are backed by a beautifully rendered planet in the background. 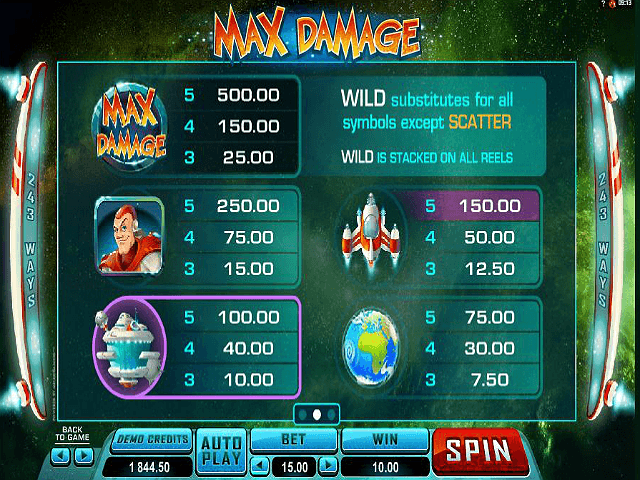 Amidst the Earth's atmosphere, the reels are loaded with icons including Max Damage, alien mother ships, space rockets, planet Earth, scatter flying saucers and Max Damage wilds. With regular number and letter icons thrown in too, there are a none-too-shabby 243 ways to win. The Max Damage wild has stacked potential over all the reels, boosting winning chances. Launching the bonus game takes you at hyper-speed into the purple galaxy, where Max can shoot down free spin aliens and potentially reveal jackpots up to the max of 120,000 coins. This game provides an authentically nostalgic Space Invaders feel and sound, plus very reasonable return-to-gamer levels averaging 96.72%. Letters and numbers deliver a range of lower-level payouts for a variety of winning symbol combinations. With over 240 ways to win this slot is high on action and can offer good value gaming sessions. Seeing three or more little green men in flying saucers is the key to launching the Alien Battle screen. 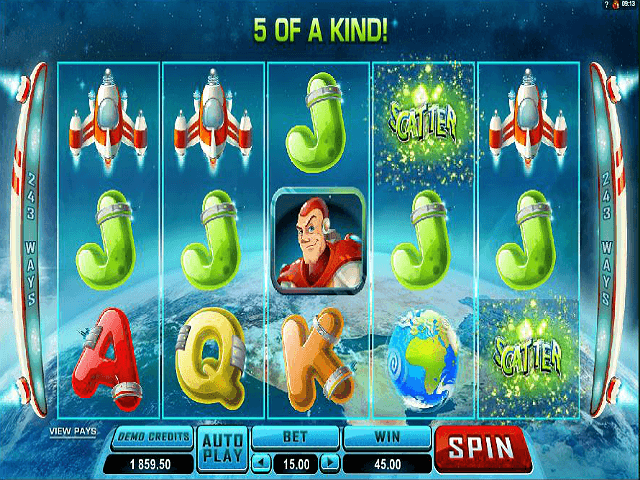 The bonus reel is played with 15 free spins and X2 payouts except for alien spaceships. Max Damage will be by your side, shooting down the baddies to reveal rewards. This is where the game's 120,000-coin jackpot payout can be won. The bonus game adds variety to the Max Damage slot and has nice purple planet visuals, plus a funky special mission theme tune that this site loves. 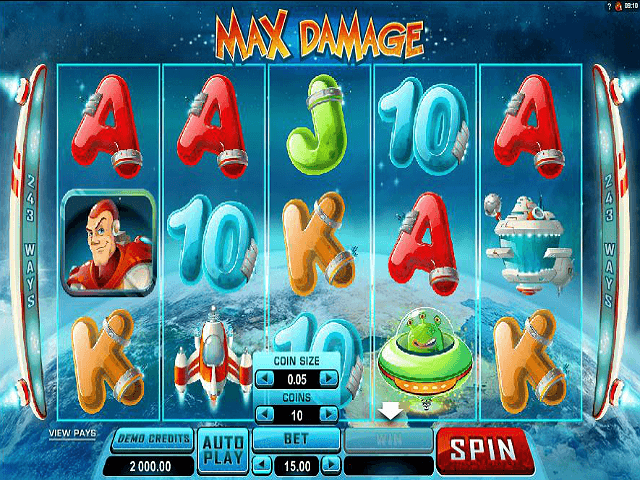 Verdict from Space: Microgaming deserves credit for relaunching Max Damage in addition to the original arcade-style gambling game. The theme was always fun and now it’s incorporated into a slot that's entertaining and full of payout chances. If you're into aliens, UFO's and beating up baddies, this game will let out the big kid in you. Share this Max Damage Review today! If you like Max Damage, you'll love these slot titles too!